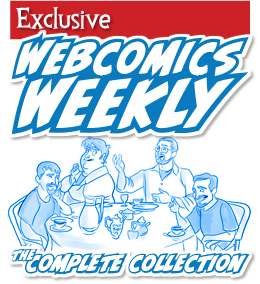 Now, for a limited time, you can see what you’re missing at Webcomics.com. I’ve opened up a special Membership Tier of $5 for a 30-day trial period. Get access to the site — the posts, the private forum, etc. — and see everything you’ll get for a full Subscription. But don’t worry! 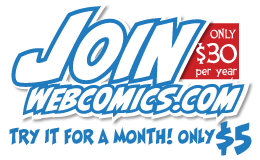 If you want to join as a full-fledged member, you can upgrade your subscription at any time. Just choose My Subscription under Member Info in the menubar. Your 1-year subscription starts on that day! And if you decide the site’s not a good fit for you, let your membership lapse and you won’t be billed again. No strings attached. I think you’ll find that you get an awful lot of information, advice and tutorials for $30/year, and I look forward to the opportunity to prove it to you. Critiques: The Webcomics.com critiques are a great way to discuss the craft of cartooning in a real-life, hands-on way. We wrapped up a Hot Seat critique series on lettering, and we opened up a list for participants for another round of the popular “Hitch It / Ditch It” critiques. Nominations for the Harvey Awards have begun. Amazon buys ComiXology: As soon as the news broke, we had a post on the site. Going past the press release (and links to comics-news Web sites with details of the acquisition itself), we posted a piece that discussed what this could possibly mean for webcomics. Heartbleed: Thanks to a quick note by a member, we were able to post a tutorial on navigating the Heartbleed virus for webcomics creators . How Many Pageviews = Success was an Archive Dive post, but it’s such a central issue to webcartoonists that I wanted to call attention to it here. The comments are just as revealing as the post itself. Taxes: Of course, April was the month for taxes, and after posting numerous posts with helpful tax-time advice, Webcomics.com was on hand with a guide to filing for an extension. “No Update Required?” A WordPress error that locked administrators into a loop that prevented them from being able to access their dashboards popped up for some. This post gave step-by-step instructions for circumventing it. Q2 Slump: Did you see your ad revenue take a dive at the beginning of the month? Webcomics.com explains the cause and follows with five tips on weathering the drought. How a Web page is Delivered to a Browser: First in a series of “How the Web Works” articles, we discuss the invisible mechanics behind something your business relies upon every day. What to Look For in an eStore Solution: This guide shows how to tell a great virtual storefront from a dud. Hack-proof your site: Is your site vulnerable to a hacker’s attack? Here’s how to tell. Patreon announced lower card-processing rates, and that means more money in the pockets of creators. Speed up your site: This tutorial shows you how to optimize your Web site for speed. CSS Crash Course: Don’t know CSS code? No problem. Use this handy method to find out how to change the look and funtion of your site. We unveiled a new feature — The Webcomics.com Poll — to get information about the current state of webcomics. This joins the Webcomics.com List, the Chat Room and the Event Calendar as new, helpful features available on this site since it was redesigned. Heck, you can even help direct the site by telling us which posts you really, really Like. Got an idea for the next one? Get in touch! 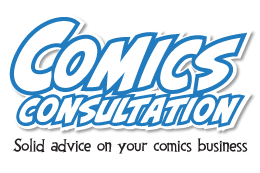 ComiCraft licencing fees: What do they mean? We get to the bottom of it. First-time convention — What should I Bring? Should I re-draw my old comics?